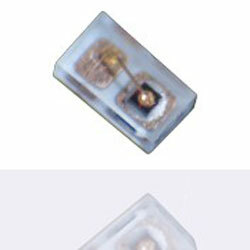 The Kingbright KPG-0603 series, available from TTI Europe, is an SMD-LED in 0201 package and offers dimensions of 0.65mm x 0.35mm and 0.2mm thickness. This series has a wide viewing angle of 135-degrees for colours red, green, yellow and viewing angle of 145-degrees for 527nm true-green and 467nm blue. The luminous intensity is from 15mcd for standard green up to 80mcd for 527 nm true-green. The series is offered in the colours red, orange, 571nm standard green, 527nm true-green, yellow and blue. The product has MSL2 and is RoHS complaint. Ideal applications include hearing aids, fitness trackers, GPS trackers, healthcare applications, wearable and portable devices.